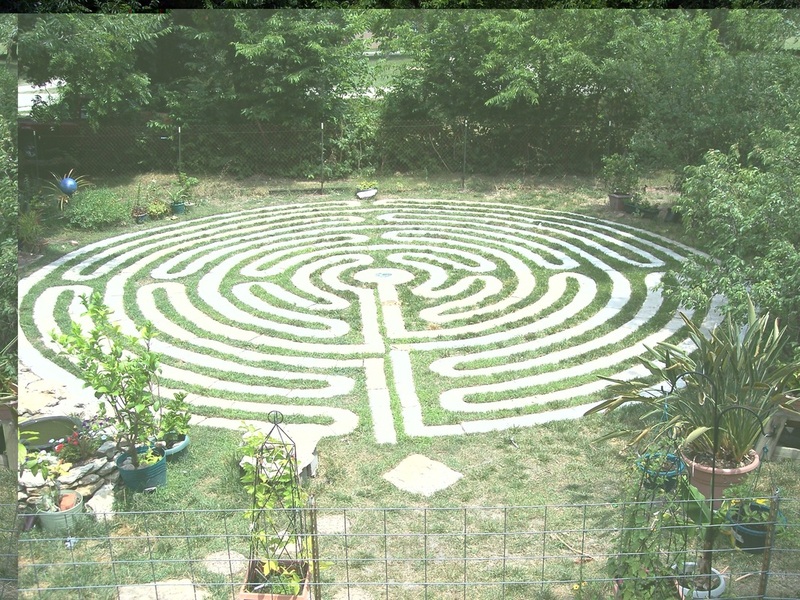 I am hosting a labyrinth walk for world labyrinth day, May 2, 2015. My garden will be open from 1:00pm till 5Pm that day. There are a few things blooming in the garden but my garden will not be at peak. In fact I have a rule not to plant tender plants till the second day of may. I have lost too many plants with a late frost. This year i may break that rule and start a little early if I have time. I have to Finnish making costumes for my day job at Allen County Community College. Their play, Antigone, is April 30, May 1, and 2.Sewing and gardening two of my favorite things! Its warming up and things are starting to come up in the garden, its so nice to see things greening up! My chickens are getting out and in the garden, this was fine in the winter, but with things coming up they need to go back where they belong. I fixed a hole in the chicken fence today and that will help but I have seen some fly over so tonight I will be clipping wings. 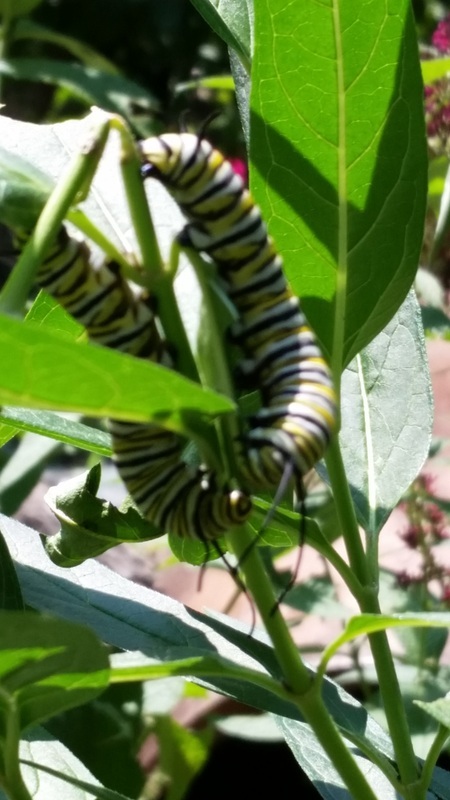 I love having them in the garden but I don't want them to eat plants I want to grow. If they would only eat weeds and never dig dusting holes or scratch up plants..... but they are chickens and that is what they do. The Wesley United Methodist conformation group from iola, returned to my garden to help clean it up. What a wonderful gift! As you know i lost my husband and helpmate and have strugled with my garden and life in general, working in the garden no longer brought me joy. Visitors, like this to my garden have helped me so much and i am returning to the work I love. I was really behind on garden jobs, never even got my fall clean up started. One day with this group of joyful workers and it is ready for spring planting! I once again have plans for the garden, a new herb bed, new plants to try, working to save the monarchs and all our native pollinators. Watch for posts to come. 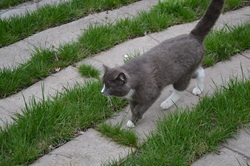 Soon I will have it all cleaned up and ready for spring, a great time for anyone to walk the labyrinth. Hibiscus, another favorite of mine. I have several, this is one I just added this spring. The folaige as you can see is tinted red, so it is pretty even when it is not blooming. 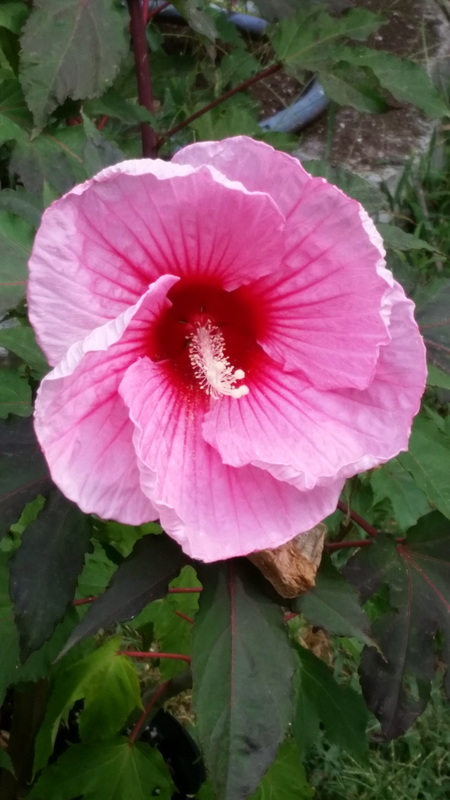 Hibiscus is another easy care plant. It does like to be fed and likes more water than some plants. it will survive dry periods, it just won't bloom as nice. 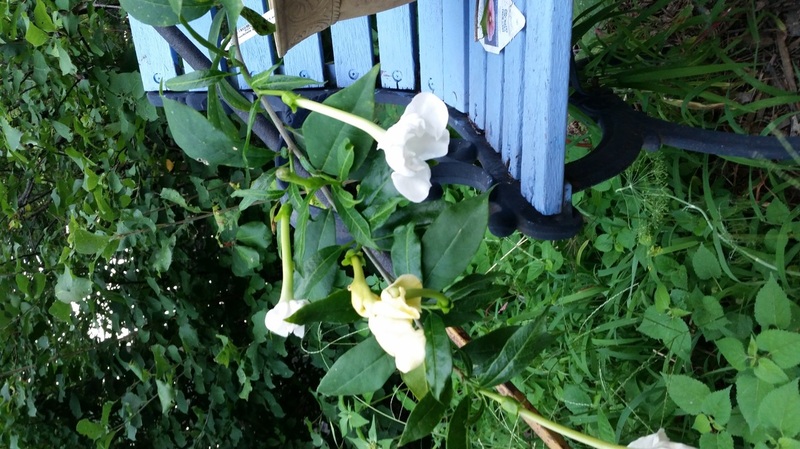 I have a beautiful large flowered white flowers, however it dose not get extra water and although it is still alive it is small and the flowers have also gotten very small. I think I will try and move it next spring, or maybe even this fall. Next time I will tell you all about an exotic potted plant I have that is blooming now, Lady of the Night. Mary's Gold, another new daylily. 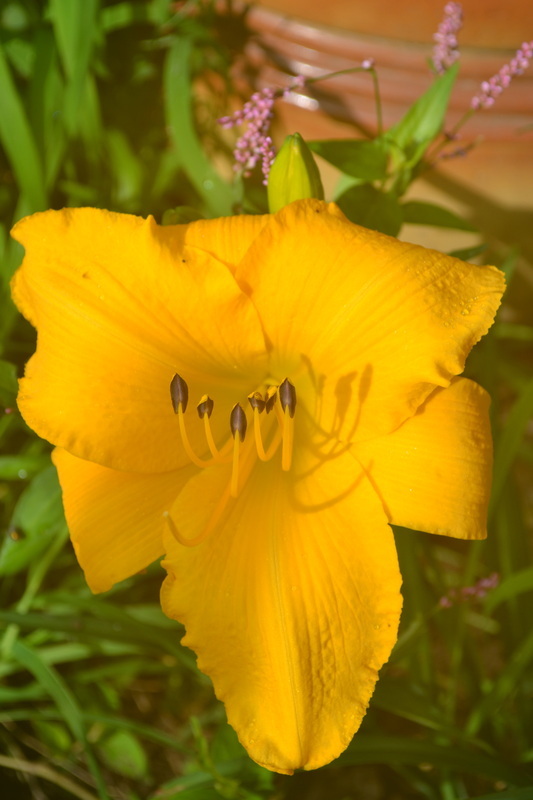 This one has huge blooms too, and like I said before daylilies are easy to care for and offer lots of color for the garden. 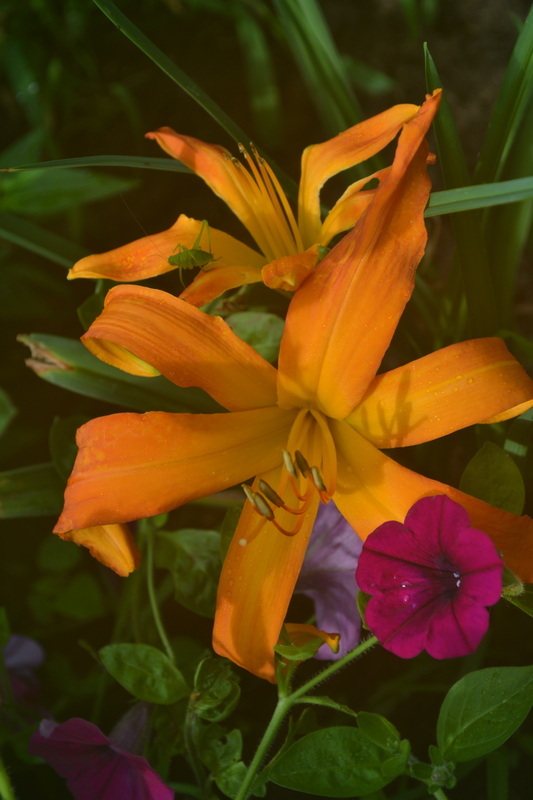 I also planted a short daylily called little grapette, but it did not bloom this year, I will have to wait until next summer to see what it does. Yesterday i went out and found my waterfall NOT working. The pump had come loose from the hose that returns water to the falls. It was churning muck inside the box it sits in. I had to clean out the box the pump sits in and clean the waterfall filter. Everything is working fine today and the water is nice and clear. Richard built my waterfall, it is also a filter and does a great job. I have pictures of each step he took to build it and I think i may give each step here and then add a page for it latter. I have been working in the garden more this year and have added some new plants. over the next few weeks I plan to highlight one new plant a week, check for something new every saturday. I really did intend to keep up with this blog but summer was even harder than I expected it would be. This summer has been better than last year a bit cooler but still dry. I did loose several plants when we got too much rain in just a few days time, I do have some drainage issues to deal with. Most plants don't like to sit in water for very long. I have had far fewer butterflies this summer too despite having lots of nectar and host plants. I hope their numbers are better next year. 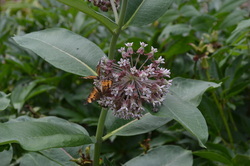 I have been seeing monarchs too but so far I have not seen as many butterflies as there were last year. The drought was very hard on all of them. I hope this year will be better for them.